Whether or not we like to admit it, all of us have completely lost our cool from time to time. Whether we've had an inappropriately emotional response to a relatively benign situation, let our frustration get the better of us in a moment of weakness, or finally snapped under the weight of an ever-growing pile of grievances, exactly nobody is capable of keeping their head straight 100 percent of the time. Perhaps that's why we love videos like these — because we can't help but see a bit of ourselves in them. In a world where everyone has a camera in their pocket, it seems like you'd have to be on your best behavior every waking moment to avoid eventually getting caught on video acting like a total jerk — a task at which the following people failed in hilarious fashion. They achieved the goal of every budding YouTuber: their viral videos blew up all over the internet … just not for reasons any of them would have wanted. Warning: Many of these viral videos are NSFW. One could make a convincing case that the entire viral video phenomenon could be traced back to August 1988, before the internet was even a twinkle in Al Gore's eye. That was when Winnebago, manufacturers of the world's most well-known RVs, hired an extremely patient video crew to shoot two 10-minute spots for their new line, starring former TV news producer and current Winnebago salesman Jack Rebney. The shoot took an unbelievable two weeks because A) a lot of random things went wrong, and B) Rebney could not stop profanely losing his mind over every one of them. Whether it was the heat, the flies, the perceived incompetence of the crew or his own flubbing of lines, Rebney was having exactly none of it, and when the shoot was completed, the video crew assembled a 15-minute outtake reel for themselves and their friends. The tape made the rounds among underground video collectors throughout the '90s before falling into the hands of filmmaker Ben Steinbauer, who became obsessed with it and resolved to make a documentary. Shortly before he began shooting in 2006, the clip was uploaded to YouTube — where, of course, it gained its widest audience yet. Steinhauer released his acclaimed documentary Winnebago Man in 2010. In it, he interviews Rebney, who had been unaware of his fame for years. His take was about what you'd expect: "Why the hell they would watch a lousy f*cking video like that is something I will never know." In 2007, Chris Crocker was a 19-year-old gay man living in the Midwest, which was almost as fun then as it is now. The poor guy was going through a tough time; his mother had just returned from Iraq, developed a substance addiction, and been kicked to the curb by her family. In addition to his most beloved female role model falling apart, his second-most beloved — pop icon Britney Spears — was getting endlessly dragged online and in the media following her disastrous "comeback" performance at the VMAs. Crocker already had a pretty substantial YouTube following, creating what were essentially performance art videos. But in September that year, he published a clip which he says was no performance: a heartfelt, tearful, borderline-hysterical plea to "leave Britney alone!" At the time, a mere hundred thousand views or so was considered "going viral." Crocker's clip received 2 million views on its first day. Of course, the internet's primary response to this sensitive teen baring his soul was widespread mockery, and Crocker was even parodied (along with literally every other viral video of the time) in a famous episode of South Park. But if the jeering bothered him, he didn't let it show. He parlayed the video into appearances on Lily Allen and Friends, Tosh.0, a Weezer video and, well, some adult movies. Where is he now? He deactivated his YouTube channel in 2015, and people still won't leave Britney alone. In 2014, this thankfully anonymous Dallas Cowboys fan had settled in to watch what should have been a massacre: the 6-1 Cowboys vs. the 2-5 Washington Redskins, in Dallas, on Monday night. But when the players took the field, it all went wrong. Behind third-string QB Colt McCoy and rookie cornerback Bashaud Breeland, Washington put up an improbably stiff fight. With the score tied at 17, the game went to overtime. Washington received, and scored a field goal — and on their last-gasp drive, Tony Romo's final pass attempt was swatted down by Breeland. Game over, Cowboys lose. Dallas fans are all too familiar with such scenarios, and for this guy, it was the absolute last straw. As the game's final moments play out (and as his amused roommates shoot video), he proceeds to take out his anger on his house. The glass coffee table, the full-size dining room table, game consoles, the kitchen countertop, guitars, the TV itself — everything must go. Throughout, our hero is screaming like a man possessed, with nearly the only intelligible words being ones which we cannot print here. This may seem like an extreme reaction, but if you've been a fan of the Cowboys since their Super Bowl days of the '90s, you have wanted to do this too. Don't try to deny it. So, you've probably seen the famous "Double Rainbow" video captured by a guy in Yosemite Park in 2010. For three solid minutes, an unseen videographer has a complete emotional breakdown over an admittedly awesome double rainbow that spans the entire sky. He yells, whoops, exclaims to the heavens, eventually breaks down into tears, and then full-on sobs. If you have seen the clip, and you're trying to tell us you guessed the man behind the camera was a 360-pound goliath nicknamed "Bear," then we're trying to tell you that you're lying. To sum up the interesting life of Paul "Bear" Vasquez, he worked as a smoke jumper, EMT, firefighter, and coast-to-coast truck driver before settling down on an 8-acre plot of land in Yosemite. He even briefly moonlighted as a cage fighter (his professional record: 0 wins, 1 loss) before going flagrantly viral with his clip, which has been viewed a ridiculous 45 million times. Unbelievably, he refused to monetize the video — meaning he only pulled down about 40 grand from his bout with internet stardom, and now gets by on about $6,000 per year, growing and foraging for everything he needs on his land. He says his life is about the same as before his viral fame, just with more interviews — but his online legacy lives on at YouTube headquarters, where a conference area has been named the Double Rainbow Room in his honor. Quick scenario: You're on a kayaking trip alone in the Alaskan wilderness. Upon returning from a pit stop in the woods, you find a big ol' brown bear contentedly munching on your beached kayak. What do you do? If you're like most of us, you flee back into the woods, leaving a trail of terror vomit and/or pee as you go, literally sprint up the nearest tree, and huddle within its branches praying to all the saints for your safety. But Mary Maley isn't like most of us. In her video, Maley begins angrily chastising the bear (addressing it consistently as "BEAR! "), before doing the unthinkable: She coaxes it away from the kayak, toward herself, so she can give it a healthy dollop of bear mace in its face. The bear almost seems to actually shrug before doing an about-face and returning to its boat-shaped entree. Maley continues to scold the bear in that exact tone your mom used to take when she caught you eating dirt (although, unlike your mom, the strongest words she utters throughout the whole ordeal are "gosh darnit!") before finally appearing to give up, as the bear simply won't be deterred by semi-harsh words. When a local news station caught up with Maley, she was the ultimate good sport in the face of the clowning her viral clip inevitably resulted in. "I mean, I'm not deaf, so I realize it's pretty funny to listen to," she said. Here's something you may not know about dogs: The herding instinct is real. You see, over hundreds of years, certain breeds have been prized for their seemingly innate allergy to disorder, and breeders favoring this trait have been able to produce entire bloodlines of canines who will effortlessly round any herd of any animal you put in front of them into a tight space. Two interesting facets of this herding instinct: it can be present in otherwise unassuming four-legged companions, and once it has been activated it can not be turned off until the job is done. Max Findlay of London discovered this one day while walking his black Labrador, Fenton, in Richmond Park. We know Fenton's name because in the clip, Mr. Findlay shouts it repeatedly, in an increasingly aggravated tone, as Fenton determines that all of these deer scattered about the park willy-nilly simply will not do. Findlay bolts after Fenton, hollering, shouting and cursing, but if he really wanted the ordeal to be over with sooner he should've just helped round 'em up. When the Telegraph caught up to Findlay, he didn't have much to say outside of "I'd rather just leave the story where it is and move on," but an unidentified friend described him as mortified. "Fenton's a lively dog, but he'd never done this before," the man said, even indicating that Findlay was considering renaming the dog, which Fenton probably wouldn't mind. If this clip were your claim to fame, you'd want a new name, too. Downtown Vancouver typically isn't a dangerous place, but one Saturday afternoon in May 2018, things got real. There was no terror attack, no gang warfare, no marauding bands of Huns terrorizing the streets; it just started raining shards of broken glass and various pieces of furniture. This was not some bizarre natural phenomenon but the work of an unidentified 56-year-old man who had apparently just had enough of all these chairs and stuff sitting around everywhere. The video was posted to Reddit where it quickly went viral because it's not every day you see office chairs and sundries being ejected from the 19th-story window of a high rise. Throughout the video, the man can be heard shouting, cursing, and calling someone a loser — presumably the same guy who can also be heard imploring the dude to stop what the hell he's doing before someone gets hurt. Fortunately, nobody did; the police responded and hauled the man (who was reportedly on drugs) off to jail, where he was charged with a slew of crimes including damage to an unoccupied vehicle and endangering lives. The moral of the story is don't do drugs or … chuck office furniture out of 19th-floor windows? It seems really obvious, but apparently it needed to be said. Being a weatherman in Michigan seems like it could get pretty dull. For eight or nine months out of the year, you could go with, "Yeah, it's probably going to be pretty cold," and even if you somehow ended up being wrong, it's not like anyone could fault you for the guess. Nobody knows this better than Detroit meteorologist Garry Frank. 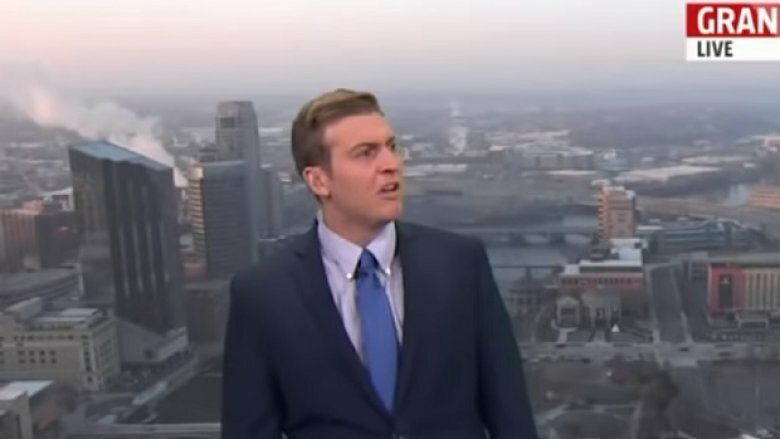 In this viral clip, it's obvious Frank had been listening to grousing from his fellow newscasters over his forecasts for roughly a century, even though he doesn't look a day over 35. After what must be the one-billionth iteration of "Huh, so it's gonna be cold again, Garry! What a shock! Yuk, yuk, yuk!" he had to endure, Frank just up and snaps. "You guys are dragging me down!" he scolds his fellow newscasters, before getting a bit personal: "Every time I get done with the seven-day, you guys are like, 'Ugghh. Goshh. Ergghh.' Every time! Doesn't matter what time I come on … and then you expect me to be chipper for five straight hours. It's miserable … I mean, what do you want me to do? Lie to you? I'll put 70 every day next time." While his co-workers chuckle nervously, Frank finishes up his forecast in the most snide, sarcastic manner possible. The icing on the cake is the clip's conclusion, as the traffic reporter meekly pokes his head into frame to ask, "Is he done? That was terrifying." James Mongiat and his bride of 14 months, Whitney, were out running errands one day when Whitney decided she really, really wanted to go to the lake. Unfortunately, James said he had an appointment to have his tires rotated and had other stuff he needed to get done, so he had to shoot the suggestion down. James would later claim he had an idea how Whitney would react to this disappointment, as it had been somewhat of an ongoing issue. As he began to shoot video and patiently explain to her why the lake would have to wait, Whitney — a 30-year old woman — threw a tantrum which would make the average toddler shake their head and say, "Man, that's just excessive." The outburst has to be seen to be believed, but it won't be spoiling anything to say the word "lake" is screamed angrily throughout. James claimed he taped the incident because he wanted to show Whitney her own behavior, but that explanation kind of fell apart in light of the fact that he uploaded it to YouTube the very next day. Of course, the internet latched onto the clip with the single-mindedness of a woman pining for a day at the lake, at which point things got predictable: James moved out, Whitney filed for divorce, and the internet moved on to the next embarrassing viral video. You saw the warning already, but it bears repeating here: This clip is so very not safe for work, unless you work in a profanity factory, in which case you're about to boost your productivity big time. There is no single word in this video that can even be quoted here, except maybe for "the," which doesn't explain much. But you'll probably want to bookmark this clip for when you're having a really bad day because no matter how bad it is, the day this guy is having is way worse. In the clip, our unidentified hero is playing an electronic gambling machine called Global Draw Roulette. He's not having a very good time of it. His losing streak prompts him to heap verbal abuse on Jesus, God, Christmas, and the machine itself. Other patrons of the establishment can be heard whispering nervously as the guy slanders the entirety of the Christian religion, and (according to the description) the clip ends just before he hoists the chair he's sitting in and caves the machine's face in with it. Apparently the poor dude lost over £10,000 in that one sitting, but hopefully the experience taught him a valuable lesson. You know what they say: Global Draw Roulette works in mysterious ways.